The North Quire Aisle of St George’s has been filled with scaffolding since the middle of June. 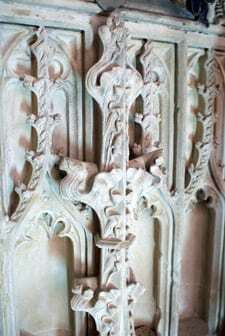 Conservators have been working to clean the stone vaulting and bosses which had become heavily covered in layers of grime caused, in part, by oil lamps and candles over the centuries. The contrast between the cleaned areas and the ever diminishing dirty patches was striking throughout the clean. Soft brushes and de-ionised water were used to coax off the dirt or, in areas where the problem was more deep seated, poultices drew the dirt out. A large number of masons marks were found some of which match marks found in the cleaning of the South Quire Aisle two years ago. 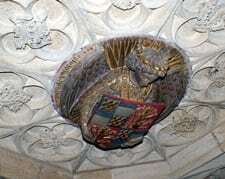 A boss displaying the coat of arms of King Edward IV is adjacent to his tomb. To the west there are six other large bosses carved as angels holding coats of arms. The four photographs show the aisle and vaulting gradually becoming cleaner from early July to mid September. 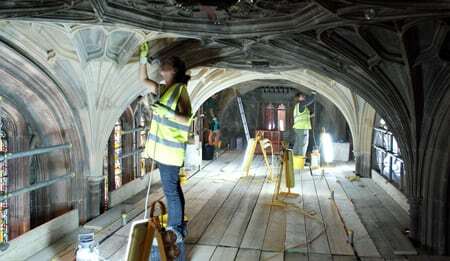 On 28 September the top layer of scaffolding was removed so that cleaning of the walls and the outside of the Hastings Chantry could be completed. It is hoped that the work will be finished by mid October and all the scaffolding then removed to reveal the cleaned aisle. 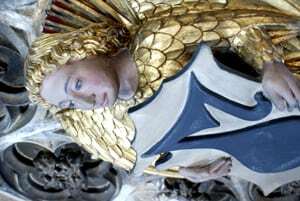 The work of cleaning and conserving the North Quire Aisle was paid for by the Friends of St George’s & Descendants of the Knights of the Garter. A large part of the grant came from the American Friends. All at St George’s are grateful for the support of the Friends organisation and the many others who support the life, fabric and work of the College of St George. For more information about the Friends of St George’s please click here. Previous PostPrevious What’s on at St George’s from July to September 2011?